Irrigated agriculture is vital to the livelihood of communities in the Elkhorn and Loup River Basins in Nebraska, and ground water is used to irrigate most of the cropland. Concerns about the sustainability of ground-water and surface-water resources have prompted State and regional agencies to evaluate the cumulative effects of ground-water irrigation in this area. To facilitate understanding of the effects of ground-water irrigation, a numerical computer model was developed to simulate ground-water flow and assess the effects of ground-water irrigation (including ground-water withdrawals, hereinafter referred to as pumpage, and enhanced recharge) on stream base flow. The study area covers approximately 30,800 square miles, and includes the Elkhorn River Basin upstream from Norfolk, Nebraska, and the Loup River Basin upstream from Columbus, Nebraska. The water-table aquifer consists of Quaternary-age sands and gravels and Tertiary-age silts, sands, and gravels. The simulation was constructed using one layer with 2-mile by 2-mile cell size. Simulations were constructed to represent the ground-water system before 1940 and from 1940 through 2005, and to simulate hypothetical conditions from 2006 through 2045 or 2055. The first simulation represents steady-state conditions of the system before anthropogenic effects, and then simulates the effects of early surface-water development activities and recharge of water leaking from canals during 1895 to 1940. The first simulation ends at 1940 because before that time, very little pumpage for irrigation occurred, but after that time it became increasingly commonplace. The pre-1940 simulation was calibrated against measured water levels and estimated long-term base flow, and the 1940 through 2005 simulation was calibrated against measured water-level changes and estimated long-term base flow. The calibrated 1940 through 2005 simulation was used as the basis for analyzing hypothetical scenarios to evaluate the effects of ground-water irrigation on stream base flow for 1940 through 2005 and for 2006 through 2045. Simulated base flows were compared for scenarios that alternately did or did not include a representation of the effects of ground-water irrigation. The difference between simulated base flows for the two scenarios represents the predicted effects of ground-water irrigation on base flow. Comparison of base flows between simulations with ground-water irrigation and no ground-water irrigation indicated that ground-water irrigation has cumulatively reduced streamflows from 1940 through 2005 by 888,000 acre-feet in the Elkhorn River Basin and by 2,273,000 acre-feet in the Loup River Basin. Generally, predicted cumulative effects of ground-water irrigation on base flow were 5 to 10 times larger from 2006 through 2045 than from 1940 through 2005, and were 7,678,000 acre-feet for the Elkhorn River Basin and 14,784,000 acre-feet for the Loup River Basin. The calibrated simulation also was used to estimate base-flow depletion as a percentage of pumping volumes for a 50-year future time period, because base-flow depletion percentages are used to guide the placement of management boundaries in Nebraska. Mapped results of the base-flow depletion analysis conducted for most of the interior of the study area indicated that pumpage of one additional theoretical well simulated for a future 50-year period generally would result in more than 80 percent depletion when it was located close to the stream, except in areas where depletion was partly offset by reduced ground-water discharge to evapotranspiration in wetland areas. In many areas, depletion for the 50-year future period composed greater than 10 percent of the pumped water volume for theoretical wells placed less than 7 or 8 miles from the stream, though considerable variations existed because of the heterogeneity of the natural system represented in the simulation. For a few streams, predicted future simulated base flows declined substantially. In two streams, the simulated results indicated that a gaining stream in 2005 would be a losing stream in 2055. For three streams simulated base flows in 2055 were absent. No further base-flow depletion occurred once simulated base flow was absent; therefore, base-flow depletion as a percentage of the volume pumped more than 50 years declined from the time the stream went dry until the end of the analysis period. Additional depletion as a percentage of pumping would be expected if base flow was present through 2055. 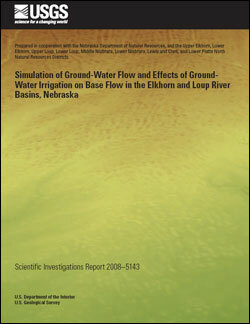 Peterson, S.M., Stanton, J.S., Saunders, A.T., and Bradley, J.R., 2008, Simulation of ground-water flow and effects of ground-water irrigation on base flow in the Elkhorn and Loup River Basins, Nebraska: U.S. Geological Survey Scientific Investigations Report 2008–5143, 65 p.